Number 3 Silver Street in Thornbury was the address of a large property made up of several smaller properties. In the photograph shown here, we believe Number 3 comprised the building with the double gabled roof on the right side of the street and the two buildings to the right of it. We are grateful to South Gloucestershire Council for allowing us to copy the deeds of this and the adjoining properties. We are particularly fortunate because the deeds of three constituent buildings are being held in the same packet and these follow through to the time when the buildings became one. ‘Cobb Hall’ – is the name given to to the small building on the right. Click here to read the early history of this building. Note – although nothing is mentioned in the deeds, it is likely that the original buildings were re-developed at some time, and the ones shown in the above photo may not resemble what they looked like in earlier times. The properties descended from Thomas Stokes to the family of his daughter, Ann who married John Salmon, a mercer from Bristol. John and Ann continued to let the properties out to tenants, until the properties passed to one of their grandsons, another, John Salmon. It appears that John combined the properties into one and this became the family home of Edward Salmon, a surgeon and general practitioner and a cousin of John Salmon. Alfred Phelps – the 1899 Rate Book shows the house and yard were owned by W. G. Salmon and occupied by Alfred Phelps. The 1901 Census shows Alfred B. Phelps was a gardener (not domestic) aged 37 born in Oldbury. He was living there with his wife, Leah aged 49 also born in Oldbury and their three sons: Robert, a carpenter’s apprentice aged 17 born in Oldbury, Albert Edward, a saddler’s apprentice aged 16 and Henry aged 13, both born in Thornbury. They also had two boarders, Henry Highnam a butcher from Oldbury and Simon Vivash, an assistant main road surveyor from Strensham in Worcestershire. Alfred was born Alfred Blizzard Phelps and he was baptised in Oldbury on 13th May 1864. The baptism record just shows his mother, Mary Ann Phelps, who was living at Kington at the time. The 1881 Census shows Alfred living in Pullins Green, Oldbury with his uncle and aunt, George Blizzard and his wife, Emma (nee Phelps. We suspect therefore that Emma was the sister of Mary Ann Phelps (Alfred’s mother) and that his father had been a member of the Blizzard family. Alfred was a groom. In 1883 Alfred Blizzard Phelps married Leah Allen. She was the daughter of Luke and Abigail Allen of Odbury. The Scribes Alcove website only has entries for two of their sons: Albert Edward baptised on 5th April 1885 and Henry baptised on 7th August 1887. The 1891 Census shows the family living at Crossways, but by 1894 the Rate Book shows Alfred and his family briefly living at the Church Institute, later 11 St Mary Street, but by 1899 they had moved to Silver Street. They didn’t stay in Silver Street long. Alfred went to Canada in 1905 and in 1906 they were joined by Leah and the three boys. The 1911 Census shows them living in Portage la Prairie in Manitoba. The 1916 Census shows them all in Neepaura, North Norfolk, Manitoba. Henry and Albert were shown as serving in the Army and living at Camp Hughes. It appears that Robert must have married and had a son, Albert who was aged 5. 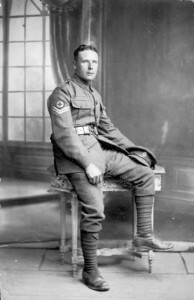 The army records show Albert joined the 184th Overseas Battalion of the Canadian Overseas Expeditionary Force on 20th March 1916. He was described as working as a farmer and saddler, 5ft 7 inches tall, with dark complexion, grey eyes and dark hair. Henry joined the same unit on 14th March 1916. He was a street car conductor, married to Ruth Jane who lived at Kildonan in Manitoba. He was 5ft 6 inches tall with fair complexion, grey eyes and fair hair. Alfred died in North Norfolk in 1932. The census shows that George and Elizabeth had had 12 children, six of which were still living. Ursula was noted as being a nurse which have been because she was caring for her parents. Ursula Powell Fry had married William Thomas Chandler in 1878. The 1881 Census shows that they lived in Horfield in Bristol. William was a shopman in the leather trade. and a note on the census describes him as a currier. They had a daughter Mary then aged 12. By 1891 Ursula was widowed and working as a sick nurse to an elderly lady in Clifton. By 1901 Ursula lived at 22 High Street with her parents. Ursula died in Tytherington aged 83 and she was buried in Thornbury Cemetery on 15th July 1927. Edward Burchell – we suspect that George’s house was being shared by Edward Burchell who the 1911 Census shows was occupying two rooms. The property was advertised for sale at auction on 22nd October 1919. It was described as ‘that convenient messuage or dwelling house with outbuildings situate in Silver Street. The house contains seven bedrooms, three front sitting rooms, kitchen, back kitchen, pantry, scullery, good underground cellar and large coachhouse and laundry adjoining. The outbuildings comprise stable, coal and wood house. The house and premises are in the occupation of Mr. R. Champion’. The Champions – on 26th September 1922 Charlotte Golding Champion bought the property from the executors of William Grove Salmon for £325. Charlotte was the wife of Reginald Arthur Harris Champion, nurseryman of Silver Street. It was then described as being in the occupation of ‘Francis Williams and his undertenant’. Reginald Arthur Harris Champion was born in Cam in Gloucestershire on 25th July 1878. He was the son of Arthur Oswald Champion and his wife, Diane (nee Harris). The 1881 Census shows that Reginald’s mother had died, presumably at the birth of Reginald’s little sister, Mabel, who was only three months. His father was working as a clerk in a wool factory aged 26 born in Stonehouse. The 1891 Census shows that Reginald was away at boarding school in Weston in Somerset. The 1901 Census shows he had settled to live at 1 Burton Street, Bath and he was working as a grocer’s assistant. On 23rd May 1904 Reginald married Charlotte Golding Williams in the Independent Chapel in Thornbury. Charlotte was the daughter of Francis Williams who ran The Seed Supply in Thornbury and his wife, Charlotte Golding. The marriage record shows that Reginald was living in Croyden in Surrey at the time of the wedding and it seems like the couple settled in that area. Their son, Francis Arthur was born on 18th August 1905. By 1909 they had moved to the Bristol area where their second son, Herbert Reginald was born on 30th July 1909. We can’t trace the family in the 1911 Census, but they appeared to move from Cheltenham to in Thornbury in 1917 when both boys were admitted to the Council Upper School. School records show that they were living on Silver Street and we suspect that they moved into 3 Silver Street as the subtenants of Francis Williams, Charlotte’s father. We are slightly puzzled about the information shown in the electoral registers of the 1930s. The 1931 register shows Charlotte has moved to live in the High Street, presumably taking over her father’s property known as The Seed Supply. Reginald and their son, Francis were shown as being in Silver Street. The 1935 register lists mother and son living in the High Street, but no sign of Reginald. In the 1938 register Reginald was still not listed. However we do know that Reginald was living in the town. On March 12th 1934 the Western Daily Press reported a horrific air crash in Thornbury in which the pilot was able to parachute to safety but a fellow airman was killed. One of the witnesses to this accident was “R.A.H. Champion” who was not only in Thornbury High Street with his son at the time of the crash but was also described as a “representative of the ‘Press and Mirror’. This same report also mention that the son of R.A.H. Champion referred to in the article had served in the R.A.F. for eight years. (Records from the Internet show Francis Arthur Champion as FS (presumably Flight Sergeant) in 403 Squadron and it was noted that he was ‘mentioned in dispatches’). The 1938 register shows that Charlotte was still in the High Street. At that time Frances was married and living in Church Road. The special register compiled in 1939 in preparation for the war lists Herbert R. and his wife, Dorothy A, as living with his parents at The Seed Supply. Charlotte was described as shopkeeper (seed dealer), Reginald was rate collector for the R.D.C., Herbert was a C.I.D police officer (Metropolitan). By 1946 both Charlotte and Reginald were living at the Seed Supply, High Street. The trade directories show Reginald was Secretary of the Thornbury and District Horticultural Society in 1927 and 1931. Reginald was Clerk to the Parish Council from 1942 until his death in 1952. He died on 10th March 1952 aged 73. There is a note in the Parish records saying ‘it is understood that a safe owned by the Parish Council is being being allowed to remain at the late Clerk’s residence (Mrs Champion, High Street, Thornbury) until a suitable repository can be found’. Charlotte carried on living at the Seed Supply, now also known as 21 High Street. She died on 19th February 1960 aged 82. William Arthur Liddiatt – on 11th April 1935 William bought the property from Charlotte Golding Champion for £275. William was described as being a builder at the time of the purchase and had been living in the property as tenant. William was born on 29th December 1883, the son of William Liddiatt and his wife, Ellen (nee Bennett). He was brought up with the family living at 45 St Mary Street, but by the 1901 Census he was in service. He was a groom and gardener aged 17 living at Wentwood in Cromhall. In 1908 William married Florence Edith Milliner in Bristol area. Florence was born on 11th January 1880. In the 1911 Census William was working as a chauffeur aged 27. He and Florence were living at 2 Elm Cottage, The Avenue, Sneyd Park in Bristol. Florence was aged 31 and born in Bishopston in Bristol. During the War William served with the Royal Army Medical Corps. The photo on the right shows him as a Corporal. The 1921 electoral register shows that they had moved to the Thornbury area. They were then living at Crossways, but by 1927 they were listed as living at the Knapp. By 1931 they were living in Eastland Avenue and the 1935 and 1938 electoral registers show them living in 12 Eastland Road. The register prepared in 1939 shows William was an employee of the County Council. During the Second World War he worked as a Leader in Gloucester County Council’s Rescue Service and was granted the Defense Medal for his work. Florence died on 15th March 1945 aged 55. The 1946 electoral register shows William living in 3 Silver Street. The probate record shows William was one of Florence’s executors and he was then working as a County Council employee. The other executor was Robert Mills. William died on 28th January 1963 aged 79. His last will and testament dated 2nd February 1955 appointed the solicitors, Hugh Edward Griffiths Wells and Edward Henry Thurston of Thornbury as his executors. The 1965 electoral register shows William’s sister, Mary (known as Polly) was then living at 3 Silver Street. On 17th January 1967 William’s executors sold the property to Thornbury Rural District Council for £5000. We know from the electoral registers that the property became used as multiple occupancy, presumably William Liddiatt was sub-letting parts of the building or taking in lodgers. The Colleys – the 1938 electoral register shows that Alfred James Colley was living in part of the property. He was living there with Maggie Ruth Colley, Edna Peggy Colley and also Jack Lionel Stacey. The 1939 trade directory shows that Alfred was running ‘The Chippings‘, which were refreshment rooms in Silver Street. This is remembered by Millie Mansfield, as a cafe/coffee shop which also had a small library. The Packers – Millie Mansfield also mentioned that Cecil Packer, a policeman and his family lived in part of the Liddiatt’s property. The 1946 electoral register shows Cecil C. Packer and Monica Packer were living there in Silver Street. Cecil was born in the Cirencester area in 1917. He married Monica E. Ravenhill in Gloucester area in 1940. Cecil and Monica are not listed in the 1950 register so presumably they had moved away. However the house seems to have been taken over by his brother, Leslie Kenneth Packer and his wife, Margaret (nee Beckerling). Leslie was born in the Stroud area in 1914. They had married in Thornbury in 1947 so they may have moved in at that time. Leslie and Margaret continued to live in the house until at least 1965. Joseph Clutterbuck – the 1954 electoral register shows Joseph was living in part of the property. He stayed there until at least 1965. We suspect that this is ‘Joey the post’ who used to work in Francis Hopkins shop at 18 High Street. In 1970 electoral register he is listed as living at 8 Pullins Green. The property was subsequently demolished and the land incorporated into the St Mary’s Arcade.